There’s always room in the division for more talented heavyweights, especially big guys who have fast hands and can bang. And last night in Columbus, Ohio, 26 year old Stephan Shaw scored a noteworthy win, one that will have made those fans who saw it want to see more. “Big Shot,” as the 6’4” Shaw is known, crushed Donovan Dennis in the third-round. Uncorking his hefty left hand, Shaw sent Dennis down hard twice, finishing him at the 2:08 mark of round-three. Now 11-0(8) Shaw looked very good indeed. 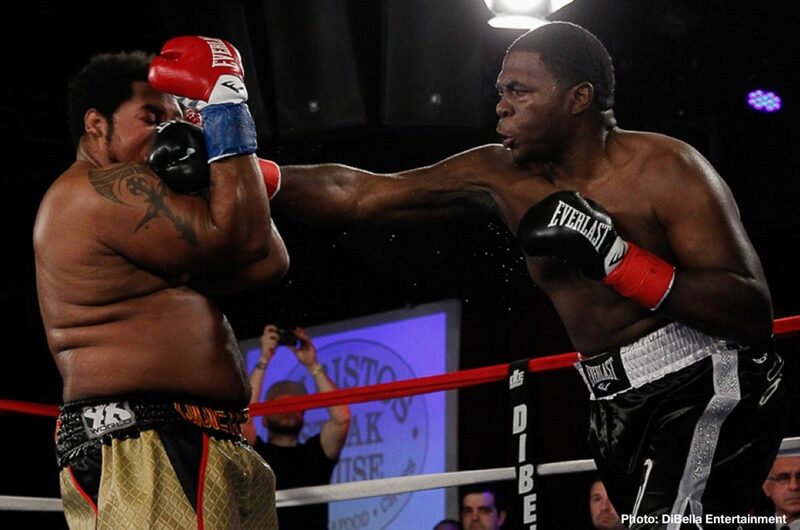 Dennis, who is now 12-4(10) was last seen extending Jarrell Miller and it is undeniable that Shaw looked better against Dennis than “Big Baby” did. Dennis was coming off a long layoff, last night’s fight being his first since the January 2016 loss to Miller, but the southpaw was in shape and he came to fight. Shaw has fast hands, raw power and he is a great talker with a big personality. Definitely one to keep a keen eye on, Shaw might just wind up featuring in some big fights down the road. The knock on Shaw is his body type. Critics will no doubt point to his less than chiselled physique and argue how Shaw should be working harder in the gym than he is. But while it’s true Shaw is no Adonis, his skills speak for themselves. It’s not a body building contest, after all – as Tyson Fury has often said. Shaw will hopefully stay busy (he fought just once in 2017 and twice last year) and get back in the ring before the summer. A pro since December of 2013, Shaw does have plenty of time on his hands at age 26 but after scoring such an impressive win as the one he picked up past night, Shaw and his team should certainly keep the momentum going while they can. Shaw sure pleased his home town fans last night and it will be interesting to see just how far he can go.